The 9 Best Christmas Tree Farms in Washington State! There’s nothing better than the smell of fresh pine to stir up memories of Christmas past. If your family enjoys including a real tree as part of your holiday celebrations, Washington State’s Christmas tree farms are the ultimate. The Pacific Northwest are some of the most significant Christmas tree growers in the country, with Washington State producing 2.3 million Christmas trees just two years ago. Here are the 9 best places throughout the Evergreen State to pick out your perfect tree this holiday. Find your perfect Christmas tree at Carnation Tree Farm in Carnation, Washington. The farm practices green farming techniques that help preserve and protect the area by using natural pest and weed control, conserving water, and planting a wide variety of plants and trees to support local wildlife. You know you’re getting more than a beautiful part of your holiday decorations when you pick and cut your own blue or Norway spruce or any of the many species of fir trees grown here. They also have pre-cut trees for those who prefer that. Snowshoe Evergreen, Inc. in Puyallup, Washington, is a family-owned business that’s been providing wholesale and retail conifers and Christmas trees for many years. What began as a dairy farm more than 100 years ago has become a successful tree farm and uses proven management practices to produce the best and healthiest trees that exceed customer expectation. A winner of multiple awards for innovation and research, Snowshoe Evergreen is the place to visit for your family’s tree. 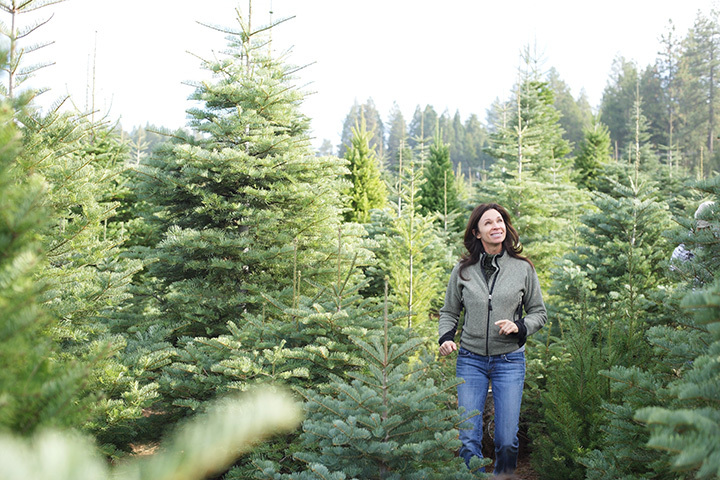 Bear Canyon Tree Farm has been growing and selling the best Christmas trees since 1949. If you’re looking for a farm that offers a good variety of trees, wreaths, and garlands in every shape and size that will adorn your home and make it picture perfect for the holidays. They’ll even ship your selection to you at reasonable rates. Experience the fun of finding and cutting your very own family tree this holiday season by coming down to Enchanted Winds Christmas Tree Farm in Issaquah, Washington. After the beautiful drive to the farm, you’ll be greeted by friendly people who will help you find your special tree and prepare it to go home with you. While you wait, you can enjoy complimentary hot apple cider and cookies. Located just outside Seattle in Port Orchard, Washington, Alpine Farms sells wholesale trees, wreaths, garlands, and other holiday decorations for your home or workplace, and they can be shipped almost anywhere in the U.S. Besides being the go-to place for your holiday needs, this family owned and operated farm has been in business for more than 65 years. They also sponsor fundraising efforts to benefit local organizations and help them spread the holiday cheer. Our quest for a Christmas tree was success and a lot of fun! If you’re in search of the perfect Christmas tree this season, check out Mountain Creek Tree Farm in Snoqualmie, Washington. Located near beautiful Mount Si, a visit to this farm will evoke memories of holidays gone by. This season, fill your home with the fragrance of a freshly cut fir tree without emptying your wallet. The only problem you’ll have when you come to Beerbower Christmas Tree Farm n Elma, Washington, is deciding what kind of tree to choose from more than 13,000 trees available. This family farm has been around for over 65 years, but starting raising and selling u-pick and pre-cut Christmas trees in 2005. Every tree on the farm is guaranteed to be free from defect, and will provide your family with a gorgeous indoor display to decorate for the holidays. This lovely 160-acre tree farm has been around for more than 30 years. Family owned and operated, Washougal River Christmas Trees in the town of the same name has plenty of choices that will ensure you find the perfect tree for the living room or your table top. You can search through the field and pick your own or select one that’s been pre-cut. Treat yourself and your family to a hot cup of cocoa and a candy cane while there, and don’t forget to take the little ones to see the animals. Are you looking to start a new family tradition this year by picking out your Christmas tree together? Three Tree Farms in Maple Valley, Washington, is a great place to visit. Three Trees Farm has been a working farm since 1916, but planting and selling Christmas trees began in 1999. Never cut a tree yourself? No problem! There are plenty of helpful people on hand to assist in selection, cutting, and preparing for transport. Treat yourself and your family to a delicious hot cup of joy while there, too. We bought our first BIG tree...19 footer!! We are standing in front of it...not the ones to the sides of us! !.#ohchristmastree🎄 Can't wait to decorate it! !